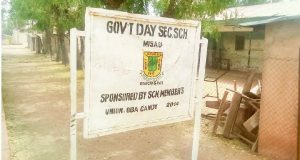 For a long time to come, the death of 20 students and two teachers of the Government Day Secondary School, Misau, Bauchi State, will linger in the memories of students, teachers, school authority, families and friends. They were travelling to Kano on excursion when their commercial bus collided with a trailer, near Gaya, Kano State. The bus was badly crushed, with 22 of the occupants dead immediately, leaving just a student and a teacher as only survivors. Most of the deceased were senior students of the Hausa Fusaha Club billed to appear on Arewa 24 TV station and Freedom Radio as part of the excursion. Only two people survived – Inuwa Mohammed, the Hausa Language teacher and Alkassim Ibrahim, an SS2 student of Arts. The two are still hospitalized in Kano. When The Education Report visited the school last Thursday, two days after the unfortunate incident, sadness evidently enveloped the entire school and indeed Misau town. “It was the saddest incident I have ever experienced in my life,” the principal, Rabiu Mohammed, told our Correspondent in his office. “Around 9.00am, one of my staffers called to tell me that there was an accident involving my students and teachers who travelled to Kano close to Gaya,” he said. The deceased were given mass burial after the funeral prayer organised at the palace of the Emir of Misau, Tuesday night. The Education Report learnt the emir has been receiving condolence visitors who come to commiserate with him over the incident, including the Emir of Kano, Muhammad Sanusi II. Abba Sabitu, SSII arts student could not stop crying, as he recounted to our Correspondent the pain of losing his friends and classmates. “I was preparing to come to school that day to say goodbye to them but I left my house behind the stadium late. “I was just approaching my school when I saw the bus at the school gate as I was walking to school. They went to pick Aisha Jarwa, our Hausa Language teacher,” he recalled. Aisha Jarwa, a divorced mother of two also died in the ill-fated trip. “I was going to pick chalk from the staff room when I heard the phone call of one of my teachers who shouted. Then I didn’t know the extent of the accident. It was later when the principal called an assembly and informed us that we knew the extent of loss the school encountered,” Abba lost two bosom friends – Usman Abba and Alkassim Ibrahim in the incident. While narrating the incident, at a point, he broke down and wept. Two days after the accident, Abubakar Ahmed, a physics teacher was still grieving over the loss of his friend, Mohammed Mohammed. Moahmmed was an agricultural science teacher who was popular among teachers and students because of his hard work and dedication. “Mohammed was like a brother to me. I first met Mohammed in Gombe when I was a student of Federal College of Education, Technical. Then I was in NCE 3. He had just applied for admission so I encouraged him all through. He later got admission to the College of Education Azare,” said Ahmed. Ahmed said their paths crossed again in 2008 when they were both employed at the GCDSS, Misau. “We got our appointment on the same day in May 2008. We reported to school same day and we have been friends until his death,” he said. Ahmed who is current studying Electrical/Electronic engineering at the Abubakar Tafawa Balewa University (ATBU), Bauchi, said the late Mohammed was an exceptional teacher and the pillar of the family. “Before the trip, I asked him if he had eaten, and he said no he couldn’t take breakfast before leaving his house. I gave him a slice of bread and carrot, which he ate before the journey,” Ahmed said. He said the import of Mohammed’s last words made meaning after his death. Mohammed had been a busy man since the incident, receiving visitors on condolence including the state governor, Mohammed Abubakar. Sadness was written all over Hauwaú Mohammed, the head girl of the school. She lost five of her closest friends and classmates. They are Naíma Aliyu Saleh, Hajara Garba, Fatima Ibrahim, Huawa Mohamed Omo and Fatima Adamu. “It still hasn’t sank in me as reality that they are dead, but since I haven’t seen them since the incident, I have accepted it as the will of God. I am not discouraged so I must keep my friends’ memories alive by doing my best in studies. We can’t also stop going on excursions to seek for knowledge,” Hauwau said as she sobbed. She told The Education Report that she is pained that she couldn’t see her friend, particularly Naíma, the secretary of Hausa Fasaha Club who wanted her to come to school that morning to bid her farewell before the journey. “I missed her calls 15 times because I had typhoid and was at home sleeping, when I finally spoke with her, they were already on their way. She told me to help me talk to her husband to-be, Isa, because he was angry and wouldn’t pick her calla. I promised I would do that. Now, she is no more. I really, miss her,” she lamented. Usman Ibrahim, brother of the surviving student appeals to the government and concerned authorities not to forget his brother. “Our parents have died and since then I am the one shouldering the responsibilities of caring for Alkassim and my other younger ones,” said Usman, a Physics teacher at the GCDSS. Usman said that Governor Abubakar had given N100,000 each to the families of the deceased but silent about the case of Alkassim and the only surviving teacher. The school was shut after the incident and would be reopen later to observe a mourning period for the students and their dedicated teachers. Being a day school, most of the victims live not far from the school and this further made the loss more felt.